The 37th edition of the Polish Fest took place this year on June 15, 16 and 17. Hosted again on the Summerfest grounds near Milwaukee’s lakefront, the largest Polish Festival on the American soil featured Polish folk dances, lively music, displays of Polish arts and crafts, traditional Polish foods, cooking demonstrations, fireworks, a colorful selection of Polish-themed souvenirs and a variety of educational programs. Some of the young attendees had also a chance to channel their competitive streak during the Polish Fest Pageants and the Chopin Youth Piano Competition. In contrast to the 2017 Polish Fest accenting the Tadeusz Kościuszko bicentennial, the focus of educational events this year was the 100th anniversary of Poland’s Independence. At the Speakers Forum, Donald Pienkos (professor emeritus of political science, UW-Milwaukee) and Neal Pease (professor of history, UW-Milwaukee) gave several passionate presentations recounting the main facets and protagonists of the events leading to the rebirth of Polish state in 1918. Another highlight of the Poland’s centennial theme was the Women of Independence exhibit illuminating the frequently overlooked fact that just two weeks after the declaration of Independence, Polish women gained full voting rights (read more about this event in our January 2018 post describing all the people, organization and events celebrated in Poland in 2018). The exhibit was prepared by the Poland’s Ministry of Foreign Affairs and displayed on the fest grounds courtesy of Polanki, The Polish Women’s Cultural Club from Milwaukee. As usual, the Polish American Congress – Wisconsin Division hosted a booth displaying informational materials about its activities. In addition to learning about programs like Wisconsin Study in Poland, visitors had also a chance to pick up the Centennial of Poland’s Rebirth leaflet summarizing the key events leading to Poland regaining its sovereignty in 1918 and the newly revised booklet Do you know Poland? (both available on this page for download). Several PAC members generously volunteered to share their knowledge about Polish culture and our organization. Our big thanks go to Karen Bauza, Rita Dow, Majka Drewitz, Camille Faherty, Judith Free, Jerzy Pasko, David Rydzewski, Nancy Staats, Derek Zarzeczny, Thomas Zarzeczny and Krystyna Zuzanski. To see your smiling face in the volunteer column next year, sign up for the 2019 Polish Fest roster. Other presenters in the Speakers Forum included Helena Pycior (professor of history, emerita, UW-Milwaukee) discussing the milestone years of Marie Skłodowska-Curie, historian John Gurda highlighting the role of Polish workers in the Eight-Hour Movement of 1886, and columnist Steven Szabados offering information useful in genealogical research. And all those interested in finding their ancestors could examine their options and even get some immediate help from the Polish Genealogical Society of America and Milwaukee County Genealogical Society. The booths of these two groups were located in the “Polish Organizations” tent, where visitors could also learn about activities of many other associations serving the needs of Polish communities the Milwaukee area. There were also some opportunities to learn some basics of Polish language and enjoy videos and colorful drawings showing the beauty of Poland – all courtesy of staff and students of the Catholic School of Jan Paul II. Saturday was a special day for Polish folk dance enthusiasts with non-stop performances on the largest stage of the event. In costumes displaying a kaleidoscopic reaches of colors, the lineup of dance groups included ensembles from Illinois (Wesoly Lud, Whispers and Wici), Michigan (Wawel Polish Dancers), Canada (Polonez Polish Canadian Folk Ensemble ) and Milwaukee’s own Syrena Polish Folk Dance Ensemble. [A group of musically gifted dancers of Syrena group performed also folk music on the festival walkways.] The warmest applause, however, went to the young dancers of Polish Highlander Ensemble “Tatry” (see the video box to the left) arriving straight from the Podhale region in Poland. As usual, the spectacular folk dance marathon ended with the dazzling Polish Folk Dance Gala hosted by PFDAA (Polish Folk Dance Association of the Americas). On Sunday morning, the huge dancers’ venue became a gathering place for the catholic faithful. This year’s mass was celebrated by Father Aron Laskiewicz and the chosen charity was the St. Ann Rest Home, a non-profit nursing home operated by Dominican Sisters. The 37th edition of Polish Fest will take place again on the Summerfest grounds near Milwaukee’s lakefront. Scheduled this year for June 15, 16 and 17, the Polish Fest program includes exuberant performances of folk dance groups, polka music played continuously on several stages, variety of traditional Polish foods as well as sampling of Polish spirits. The youngest participants might enjoy many age-appropriate performances and contests such as the Chopin Youth Piano Competition and pageants. And everybody will have a chance to pick up some Polish souvenirs and learn new skills by watching folk-artists at work and Polish cooking demonstrations. The Speakers Forum will also provide opportunities to learn more about Polish history & language and get insights useful to all curious about their ancestry (see the listing below). While the 2017 Polish Fest featured many accents linked to the bicentennial of Tadeusz Kościuszko, some events of the 2018 Polish Fest will highlight the 100th anniversary of Poland’s Independence. Among them expect to see the exhibit of Polish architecture from years 1918-1939 – courtesy of Poland’s Ministry of Foreign Affairs. 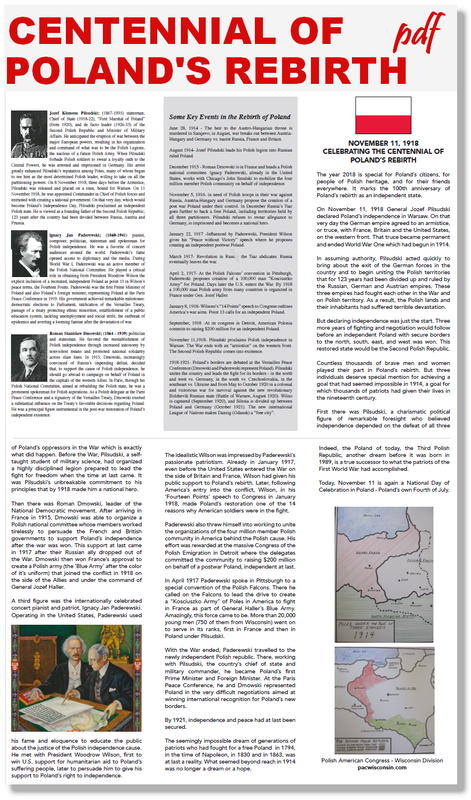 The Polish American Congress – Wisconsin Division has prepared for this jubilee year the brochure Centennial of Poland’s Rebirth summarizing the key events leading to Poland regaining its sovereignty in 1918 and their prime movers. 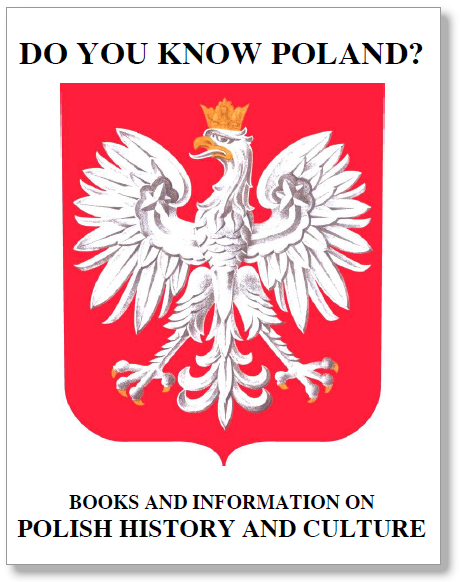 The printed copy of this leaflet will be available in the PAC-Wisconsin booth along with a variety of other printed materials promoting the knowledge about Poland and our organization. These materials will include also the newly revised brochure Do you know Poland? Finding Babcia’s Grandma – From Where Did Your Polish Ancestors Leave? Friday June 15th, 2:00-3:00 p.m.
Friday June 15th, 4:00-5:00 p.m.
Saturday June 16th, 1:30-2:30 p.m.
Saturday June 16th, 2:30-3:30 p.m.
Saturday June 16th, 3:30-4:30 p.m.
Sunday June 17th, 4:30-5:30 p.m.